This homemade costume for girls entered our 2018 Halloween Costume Contest. This is my little Izzy wearing a costume I handmade. I constructed the antlers out of pipe cleaners and masking tape attached to a headband. Painted them to make them look authentic and glued paper flowers to the front of the headband antlers. I made her sweet little face look like a little fawn. Her bodysuit is a tan unitard with fur glued on. 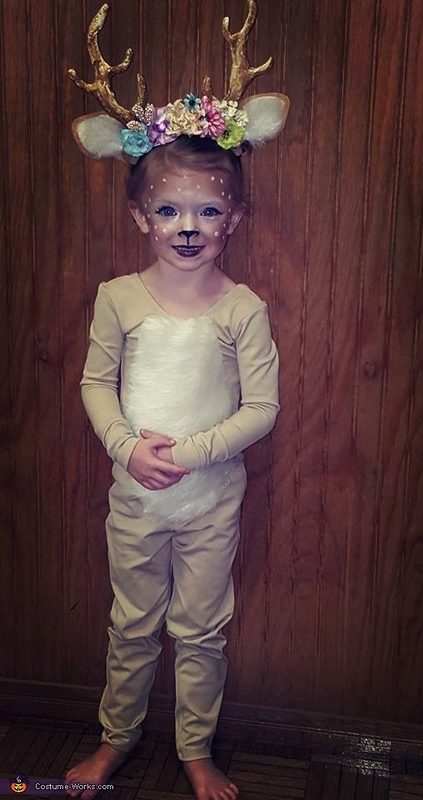 She loves her daddy and he loves to deer hunt so she wanted to be her daddy's little Fawn! !